A popcorn-inspired facial cleanser and lip scrub that has all the goodness of real popcorn without the calories; LUSH Let the Good Times Roll and LUSH Popcorn Lip Scrub are a must for everyone this season. 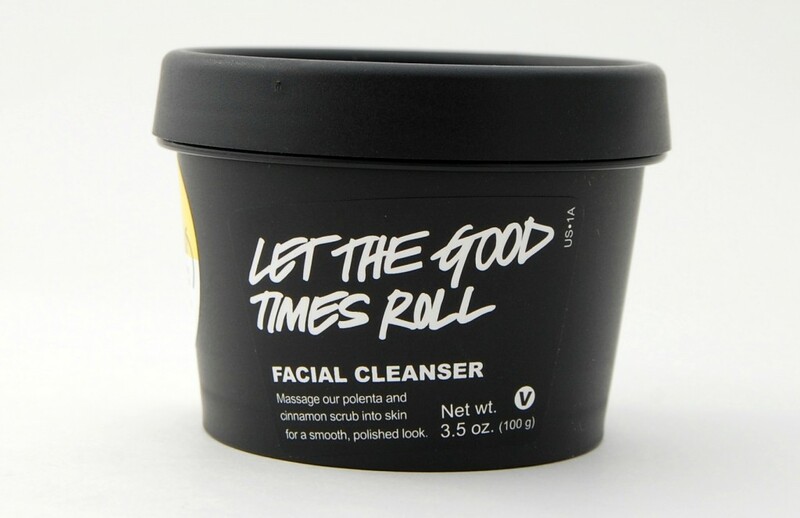 Let the Good Times Roll from LUSH Cosmetics originally started 2 Christmas’s ago as a limited edition facial cleanser, but thanks to all its admirers and fans, it has a new permanent home in the Lush facial cleanser collection. It’s suitable for all skin types, but is amazing for dry skin as it gently exfoliates, moisturises and softens the skin, while leaving behind a buttery caramel popcorn fragrance. LUSHLet the Good Times Roll comes in a tub like container that has a thick, grainy yet creamy beige texture to it that’s all hand rolled. It’s easy to work with and blends effortlessly into the skin. To start, just break off a small pea size piece of the cleanser and place it into the palm of your hand, add the smallest amount of water and work it into a paste. Gently massage the cleanser into the face and watch as it buffs away any dead skin leaving a healthy glow behind. 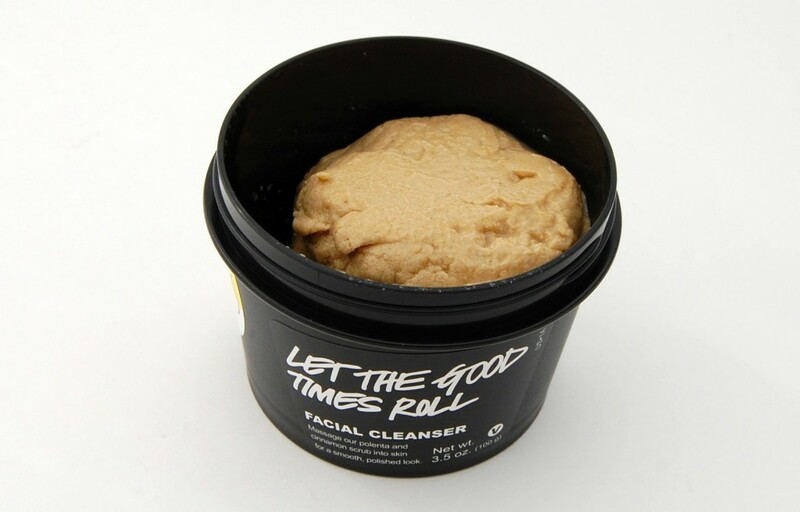 LUSH Let the Good Times Roll has wonderful, all natural ingredients, Maize flour and corn meal gently buff the skin acting as an excellent gentle exfoliator, while fair trade organic cinnamon powder gives a slight warming sensation to the skin and helps to increase circulation, which will help to heal the skin. Glycerin will help to make the application processes slicker and smoother and will also keep the skin from feeling dry afterwards. It also has popcorn in it, yes, I said popcorn which is probably why its described as having a popcorn scent, yet to me, it smells more like caramel corn or caramel cookies with a hint of vanilla. 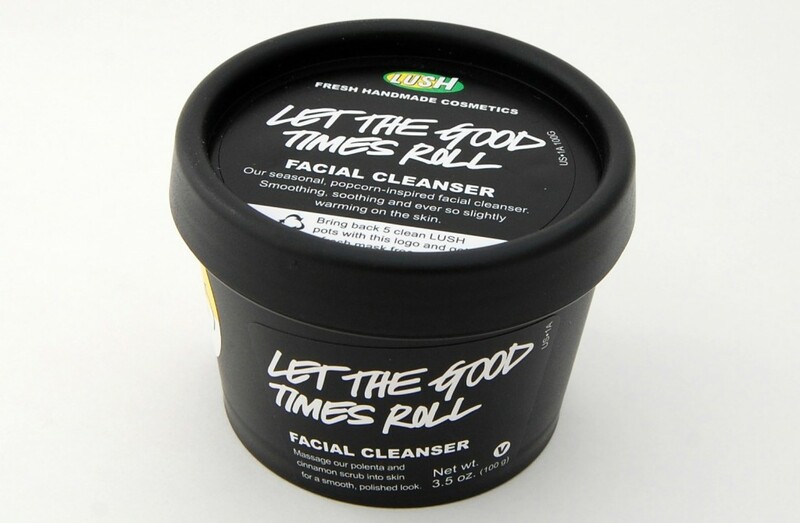 If you enjoy a yummy smelling skincare product, LUSH Let the Good Times Roll is the facial cleanser for you. 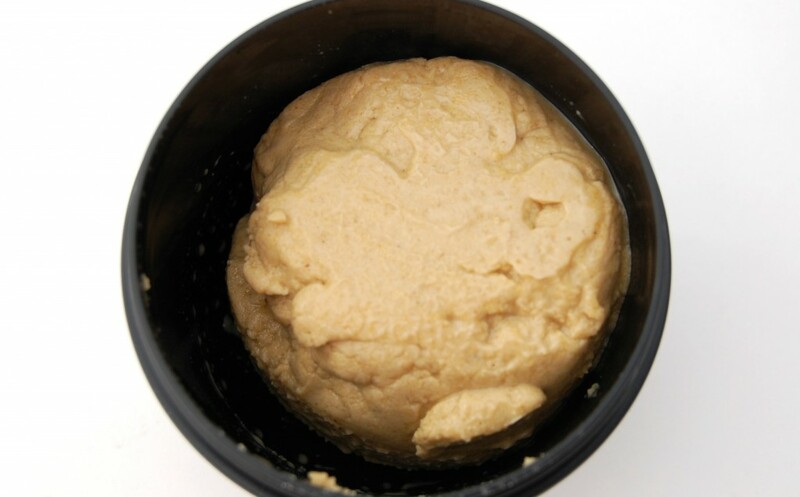 When I first opened it, I was thinking to myself, since Lush is known for its all natural products, is this safe enough to eat; it smells so good and looks like cookie dough, why wouldn’t you want to eat it? Although it has a grainy sand-like consistency to it, it has a great balance of being able to scrub away dead skin cells while still being gentle enough to cleanse skin without being too abrasive. It gently gets rid of dry skin leaving your skin feeling silky soft and smooth. It retails for $12.95 for 100g and now all they need is a shower gel version of this. 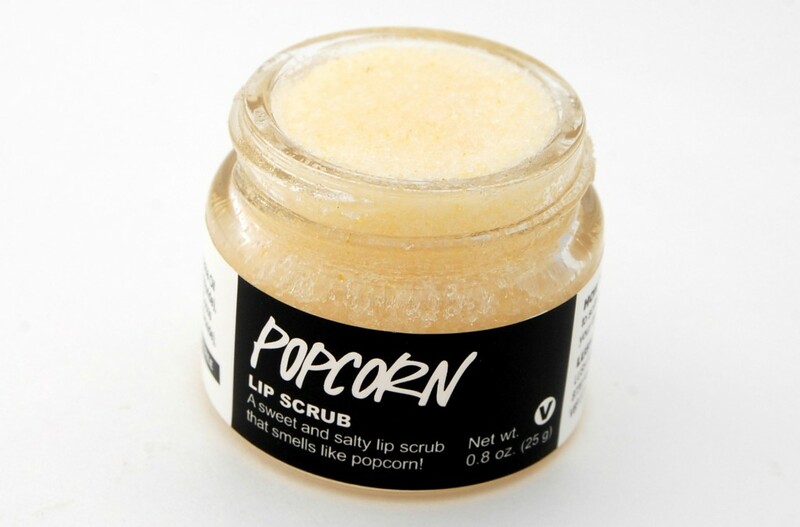 Keeping with the popcorn theme is LUSH’s Popcorn Lip Scrub, in which I’ve been through 3 of them already; I couldn’t live without it last winter and I know it will be a favourite again this season. 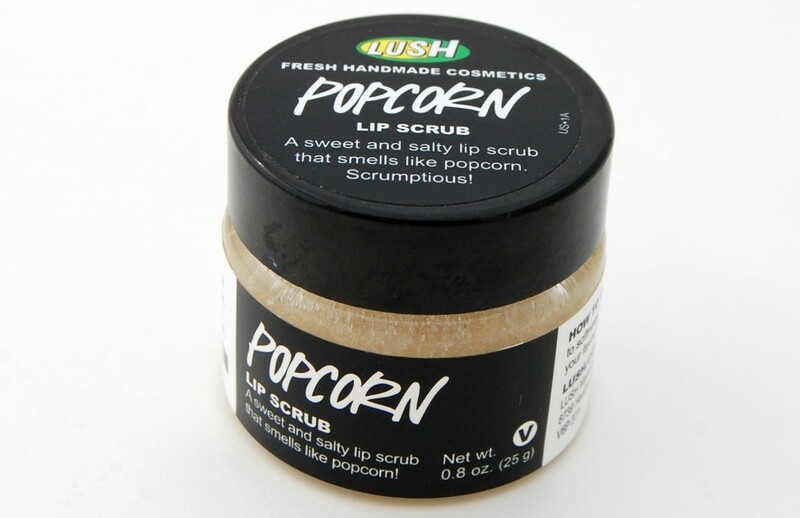 LUSH Popcorn Lip Scrub will gently exfoliate the lips, keep them moisturized all day and give your lips a soft, smooth texture. LUSH Popcorn Lip Scrub comes in a tiny heavy glass jar that’s the perfect size for your purse and has a thick grainy texture to it. It couldn’t be easier to use, take a pea-size amount of scrub on your finger and rub into lips until almost dissolved, then go ahead and lick the excess off. It has a sweet, yet salty taste to it, that’s safe enough to lick away and the same yummy scent as the Let the Good Times Roll facial cleanser. It contains sugar and fine sea salt that help to exfoliate dry skin, jojoba and coconut oil help to restore hydration leaving your lips smooth, soft and moisturized. It’s perfect to use on its own as a lip treatment, but it is also great to use before applying your favourite lipstick to keep your lips looking smooth and soft. 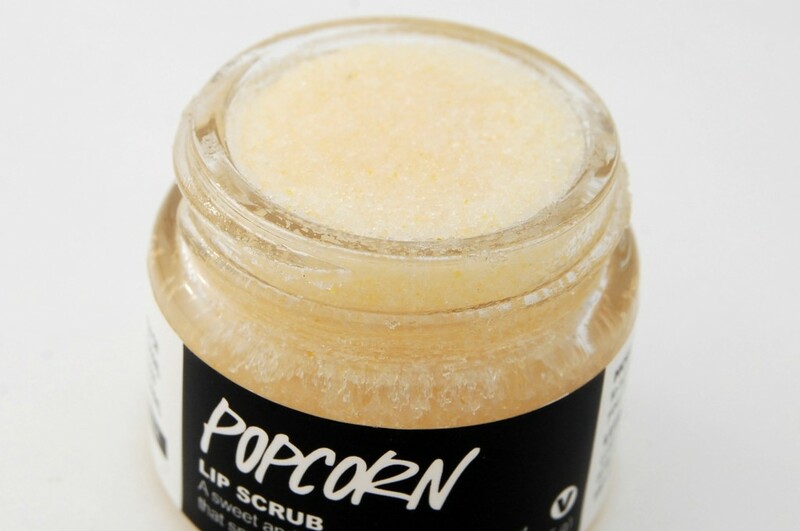 LUSH Popcorn Lip Scrub is perfect for anyone who has dry, cracked, chapped lips, anyone wanting to keep their lips satiny smooth this winter or anyone that wants to prep their lips before applying a matte lipstick. 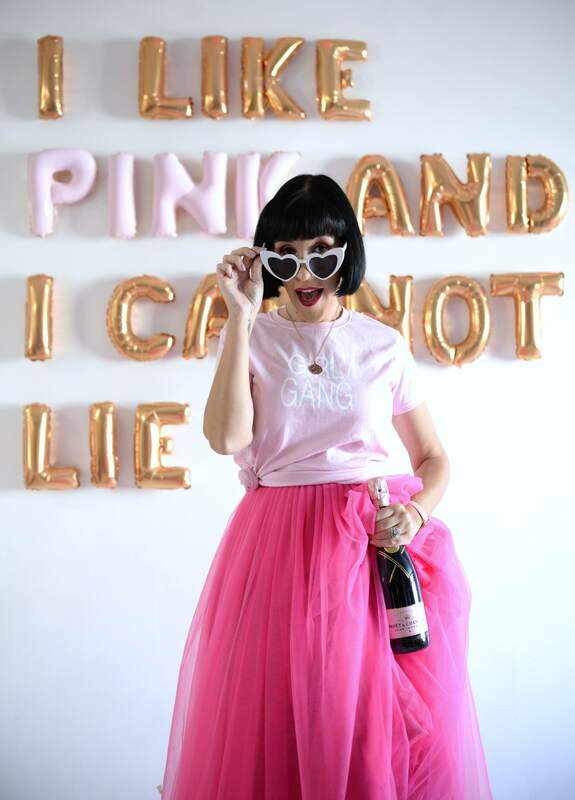 The thick, sugary formula does make things a bit messy sometimes and it can crumble and fall off your lips, but if your lips are a bit wet and you rub quickly you shouldn’t have a problem. This is the best smelling and tasting lip scrub I’ve ever tried, only problem is, it tastes so good, you end up using more of it. I find myself re-applying even when I don’t need to and thanks to its all natural ingredients I know it’s safe to eat, although it is not meant to be a snack. It retails for $9.95 for 25g. 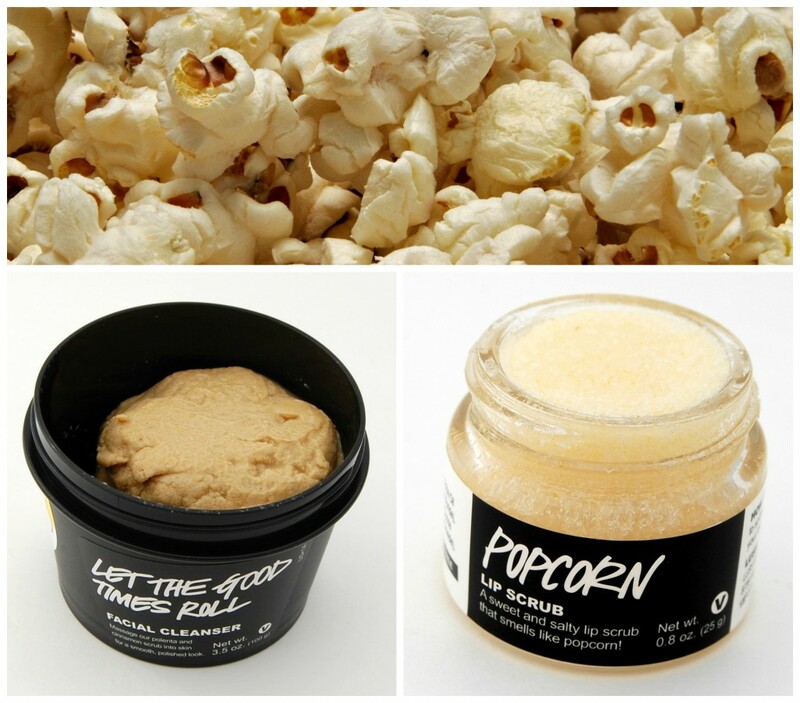 Will you be picking up any of these LUSH popcorn products this season?